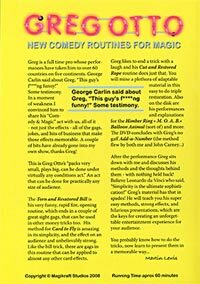 Torn & Restored Bill - Greg's very funny routine ends with a couple of great follow up sight gags. 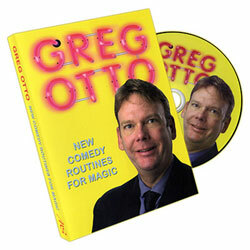 Card To Fly - Not just a trick, this is a lesson in comedy presentation. 5 minutes of solid laughs with a strong magical ending. Cut And Restored Rope - Nothing difficult, just lots of fun with a funny throwaway finish. Add-A-Number - Greg's very clean method makes a strong closer.